Earthwork excavation for foundation in all soils and sub soils and to the required depth. PCC 1:5:10 using 40mm jelly including cost of ramming curing etc all complete 4" tk. RCC 1:2:4 using 20mm jelly required thick for footing. Steel required size of column, footing & matt. Flooring 1:5:10 using 40mm jelly and thick of 3" tk. Brick work in cm 1:6 230mm tk wall up to lintel level. For column 230x230mm wherever required. Lintel cut lintel 4" in 1:2:4 using 20mm jelly. Lintel 8mm dia rod 4 numbers 8mm dia for rings necessary spacing. Above lintel concrete brick work in cm 1:6, up to roof level. From the floor level to roof brick work height 9 ½ - feet. RCC roof 1:2:4, using 20mm tk with sheet centering. Roof slab thickness 5" tk depending upon the tk will differ. Wherever required the beam in the roof slab may be provided & suitable rod design. Roof top parapet wall 2’6"height. Top of the roof cm 1; 3 flooring may be provided. Necessary point’s rain water pipe will be provided. Plastering in cm 1:4 -12 mm tk for inner and outer. Finishing all and good quality polish work for main door only. Hall – 4’x4’-1, 4’x3’-1, bed-4’x3’-1, kitchen-3’x3’-1, bath room – 2’x11/2’ windows will be provided. If extra windows, payment will be extra. From the kitchen bed above 2 side wall tile will be provide tile cost Rs.25/sqft max 75sq.ft. Wall up to lintel level tile will be provided tile cost Rs-30/sqft. Flooring Anti skid tile will be provided tile cost Rs-30/sqft. Flooring verified tile will be provided tile cost Rs.45/sqft. All-round skirting 4" tk will be provide in the verified tiles. Eurocent tiles will be provided Rate Rs.30/sq.ft. Wall-front & Adjunct: 2 walls up to roof height Rs.30/sqft tile will be provided. During the construction any expansion, the differences of cost has to pay the building owner. Inner 1’6"-loft-Bedrooms, Kitchen-One side Cuddapah: cupboard-Bed room, Kitchen-One side will be slab provided-4 width 4’x1’-size. If any extra wood works, Rs.1200/sqft is charged. All Round 4 feet height in Hollow Block work is cm1:4, 4 ½ "the wall and 2 sides plastering and 1 coat white washing (white cem). Gate maximum – 120 kg’s weight will be provided. All round the building PCC 1:5:10 using 40mm jelly & plastering the flooring – 4’’ tk concrete & plastering – Rs. 55/ sqft. (Extra). 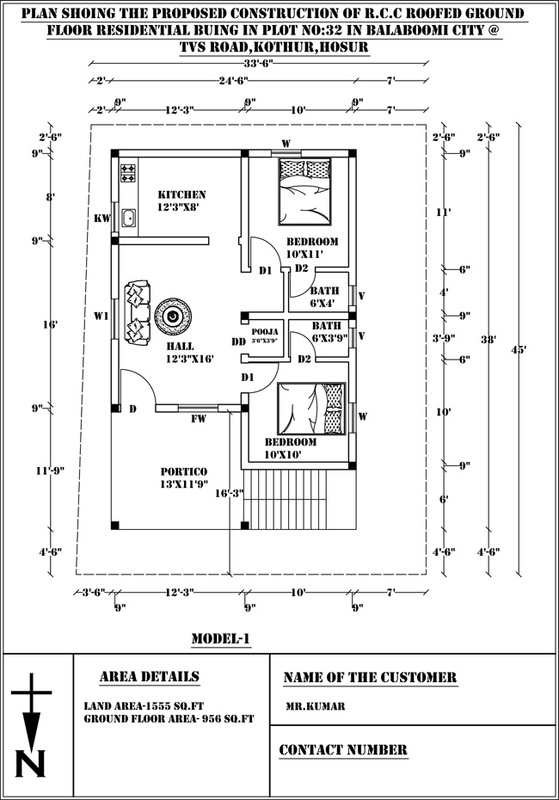 E.B Deposit Extra: The work has to complete as per the drawing and above said specification. During the construction any changes apart from drawing or any correction, rectification work, demolishing, alteration charges (material + lab our) pay by the building owner.